How Do I Perform Equal Variance Tests (Barlett, Levene and Welch's ANOVA) in Excel Using SigmaXL? Bartlett’s Test is similar to the 2 sample F-Test (SigmaXL > Statistical Tools > 2 Sample Comparison Test) but allows for multiple group comparison of variances (or standard deviations). Like the F-Test, Bartlett’s requires that the data from each group be normally distributed but is more powerful than Levene’s Test. Click SigmaXL > Statistical Tools > Equal Variance Tests > Bartlett. Ensure that the entire data table is selected. If not, check Use Entire Data Table. Click Next. Ensure that Stacked Column Format is checked. Select Delivery Time Deviation, click Numeric Data Variable (Y) >>; select Floor, click Group Category (X) >>. 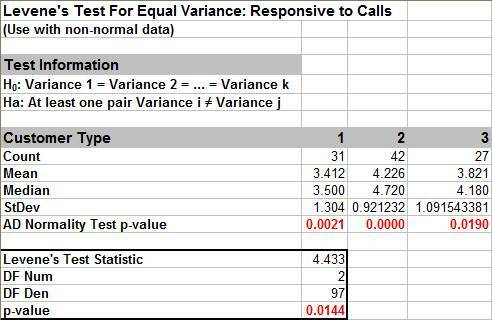 With the p-value = 0.63 we fail to reject H0; we do not have evidence to show that the group variances are unequal (practically speaking we will assume that the variances are equal). All 10 Anderson-Darling Test P-values are > .05 indicating that all group data are normal. Since the assumption of normality is met, Bartlett’s is the appropriate test to use. If any one of the groups have a low p-value for the Normality test, then Levene’s test should be used. Levene’s Test for multiple group comparison of variances is less powerful that Bartlett’s Test, but is robust to the assumption of normality. (This is a modification of the original Levene’s Test, sometimes referred to as the Browne-Forsythe Test). 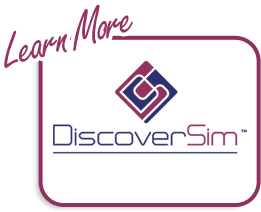 Click SigmaXL > Statistical Tools > Equal Variance Tests > Levene. Ensure that the entire data table is selected. If not, check Use Entire Data Table. Click Next. Ensure that Stacked Column Format is checked. Select Responsive to Calls, click Numeric Data Variable (Y) >>; select Customer Type, click Group Category (X) >>. The Levene’s Test p-value of 0.0144 tells us that we reject H0. At least one pairwise set of variances are not equal. The normality test p-values indicate that all 3 groups have non-normal data (p-values < .05). Since Levene’s Test is robust to the assumption of normality, it is the correct test for equal variances (rather than Bartlett’s Test). Now that we have determined that the variances (and standard deviations) are not equal, we are presented with a problem if we want to apply classical One-Way ANOVA to test for equal group means. ANOVA assumes that the group variances are equal. A modified ANOVA called Welch’s ANOVA can be used as an alternative here. Welch’s ANOVA is a test for multiple comparison of means. It is a modified One-Way ANOVA that is robust to the assumption of equal variances. Welch’s ANOVA is an extension of the 2 sample t-test for means, assuming unequal variance (SigmaXL > Statistical Tools > 2 Sample Comparison Tests). Nonparametric methods could also be used here but they are not as powerful as Welch’s ANOVA. 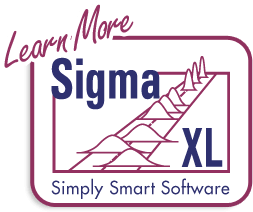 Click SigmaXL > Statistical Tools > Equal Variance Tests > Welch's ANOVA. Ensure that the entire data table is selected. If not, check Use Entire Data Table. 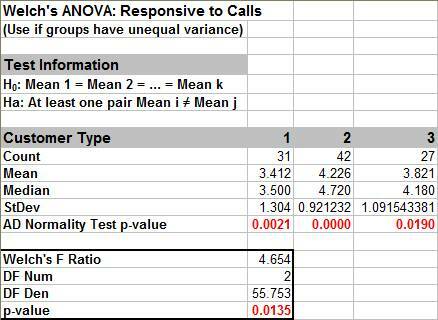 The p-value for Welch’s ANOVA is 0.0135, therefore we reject H0 and conclude that the group means for Responsive to Calls are not equal. We will explore the relationship between Overall Satisfaction and Responsive to Calls later.